DIP Campus, Chennai – 6. 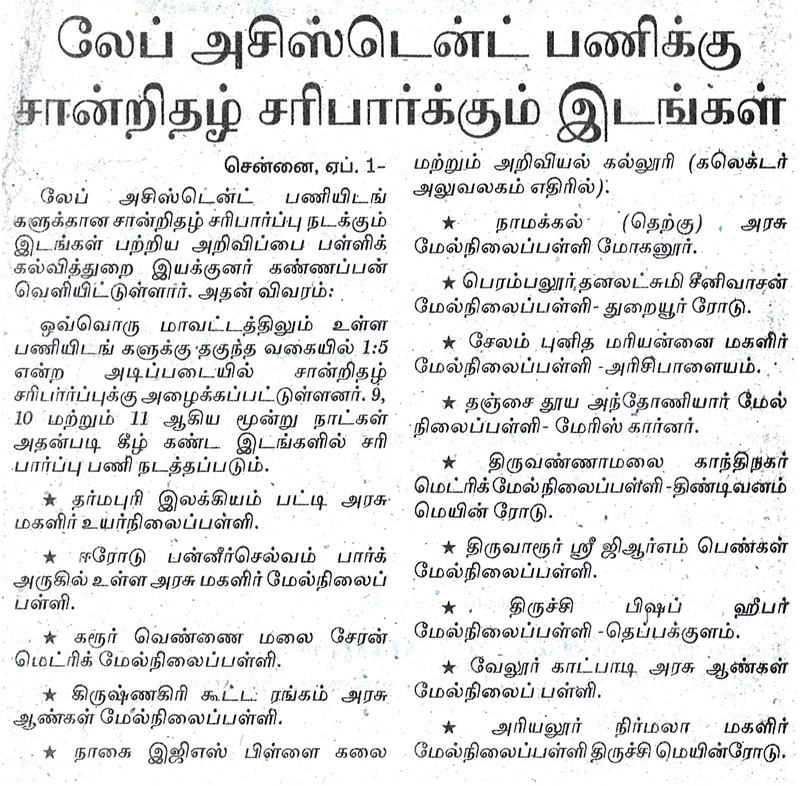 Latest News of Lab Assistant final Result - Counselling and appointment Order issued for working place. News from Tamil Nadu Department of School Education Director. 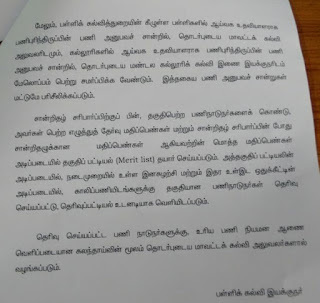 Thiruvannamalai CEO Newsnote: Lab Assistant Posts fill-up objection to Stay on Chennai High court. The Lab Assistant Final Result is published for most of the Districts, the selected candidates are requested to attend the counselling starting from 17th April 2017 onwards for select the place of posting. The Candidates are selected based on Written Examination and Certificate Verification (CV) held on 09,10,11 April 2017. The Call letter for counselling has been sent to the all selected candidates. Wish yo all the best friends! Center:St. Antony's Higher Secondary School. 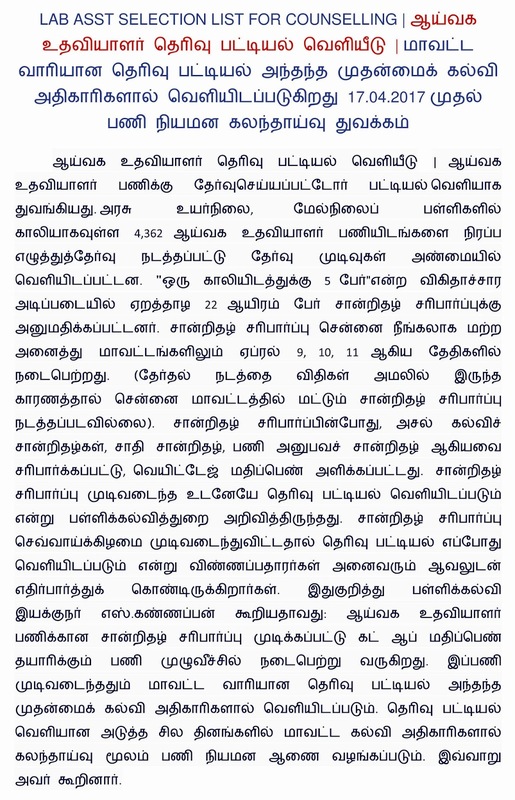 Center: Bishop Ubagarasamy Higher Secondary School, Kumar Nagar, Tiruppur. Center: Sacred Heart Anglo-Indian Convent Higher Secondary School. 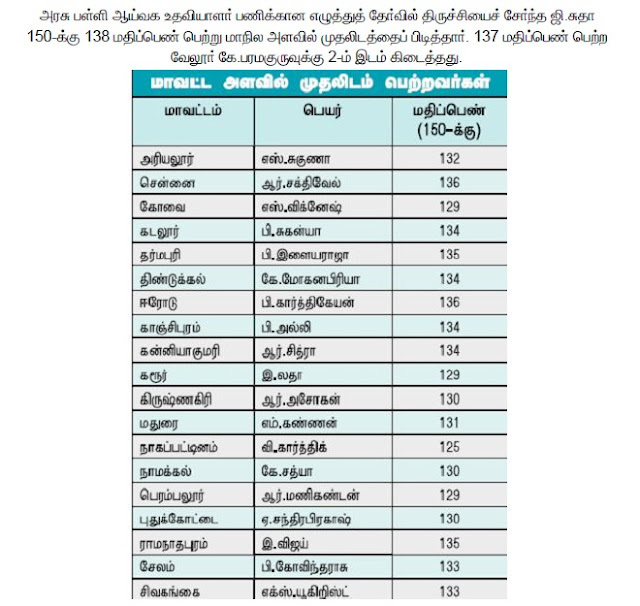 TN School Lab Assistant Job Recruitment | 21 Districts list is published [detailed list link below], Remaining Districts will be published soon…(today). The appointment counselling starts tommorrow 17th April 2017 forenoon. 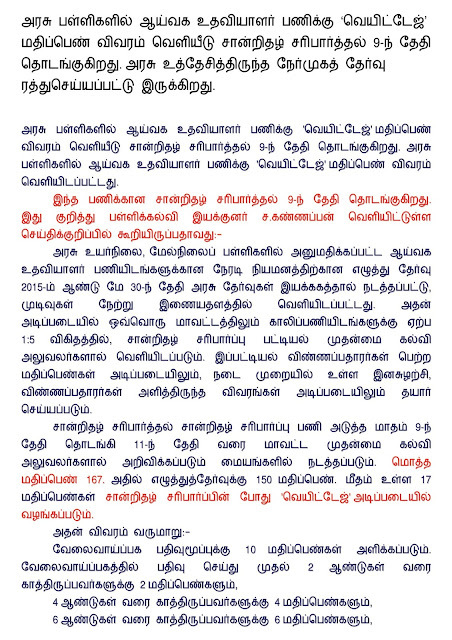 Chennai District : Click Here to Download – to be election code updated. Final Result is published in Madurai Districts, the selected candidtaes are requested to attend the counselling on17-04-2017 for select the choice of places to be worked. 52 vacancies are there, the certificate verification held on 09 to 11th April 2017. The intimation/Call letter has been sent to the selected candidates. 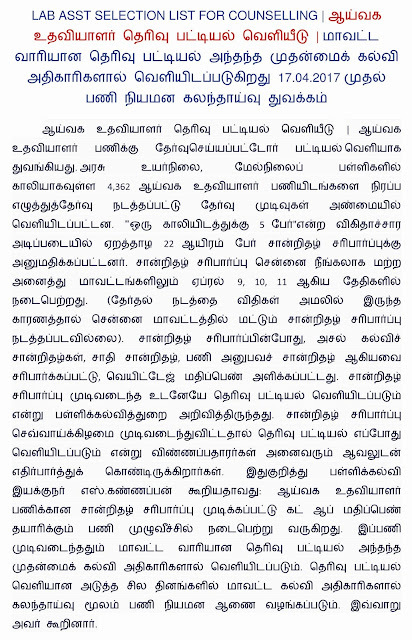 The Certificate Verification process was over in all districts candidates, except Chennai. This work conducted from 9th April to 11 April 2017. Now, the School Education Director has informed the 4362 Lab Assistant Selection List will be published within a week. District Educational Officer’s Office starts to send the call letter for Certificate Verification (CV) to the eligible candidates on 01.04.2017. 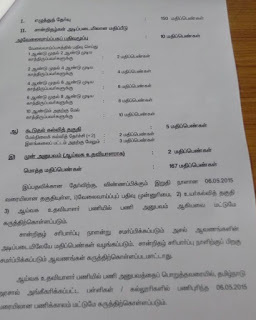 The particular candidates, who-ever received the call-letter (memorandum), should attend for CV on the allotted CV center. 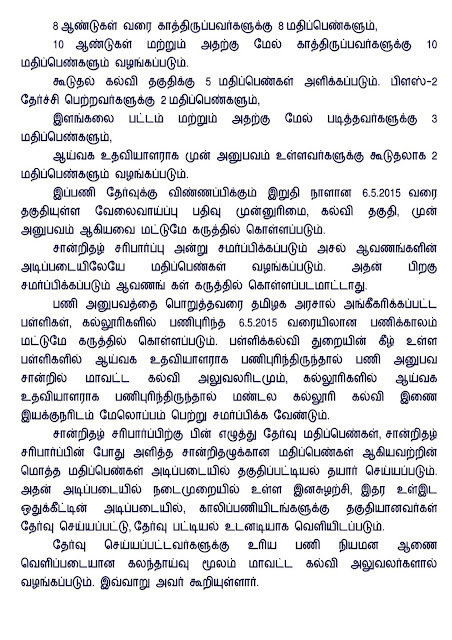 2) Chennai District: With-held, due to the bi-election code of conduct. 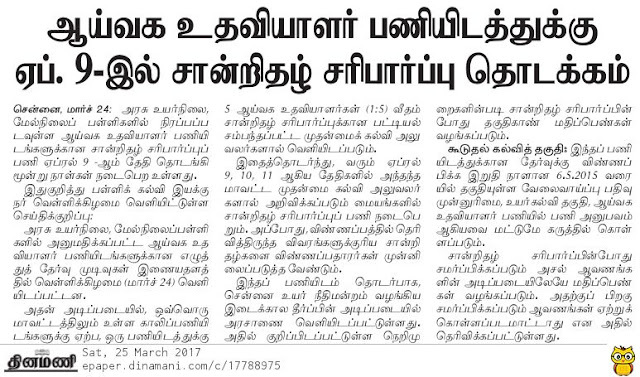 News on Dinamalar - 1st April 2017. NO PERSONAL INTERVIEW / ORAL INTERVIEW. 01-04-2017 : Lab Assistant Certificate Verification List (1:5 Ratio) and Certificate Verification Centre List to be published District wise today (01-04-2017) by respective Chief Education Officers. Weightage Mark System for Lab Assistant Recruitment. 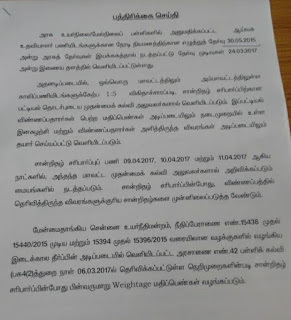 The lab assistant selection will be done according to the the School Education Department's G.O No.42 dated 06.03.2017 based on Hon'ble Madras High Courts directions. The following weightage system is proposed to be followed in the lab assistant recruitment. 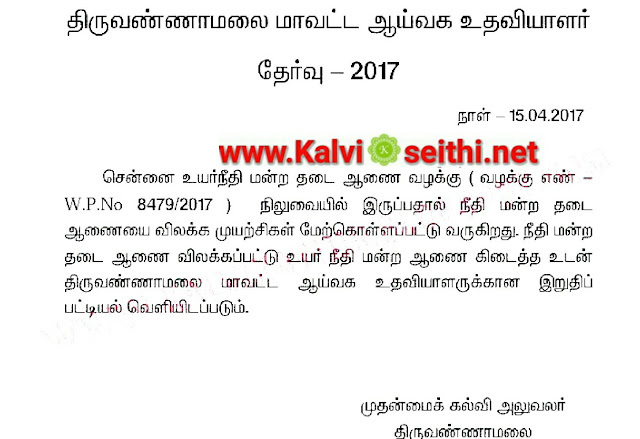 Written examination result published on 24th March, 2017. All the Best to all...!!! !